Forty years ago the concept for a national championship in any sport seemed to be out of the question. But the executives of Kinney, which has since morphed in Foot Locker, thought differently and in 1979 concocted a formula to crown an prep female & male runner in the nation. For sure it has been modified & tweaked a bit since inception but the main formula still exists. Divide the nation into four quarters geographically with each fielding runners from regional states, provide a good & noted course to challenge the runners & let them race competitively to earn the right to face each other in national championship. Noteworthy too the Kinney Corporation did not scrimp expenses even including the amenities. They flew the runners to Sunny San Diego, housed them at the lavish resort Hotel del Coronado and let them compete on the vaunted Morley Field course at Balboa Park. When the dust had settled Brent Steiner & Mary Lyons had prevailed to be proclaimed the first prep national champions in any sport. The event grew in prestige over time and fostered both changes & the growth of the sport on numerous levels but Foot Locker (Kinney) is still the one true championship. With three-quarters of the contestants being selected on the Saturday after Thanksgiving the day became known colloquially as "Super Saturday" and this year that day was November 24. What follows is a brief look a the six races, which were conducted and a listing of the qualifiers, who will be on hand on December 8 in San Diego when they join the West Regional qualifiers. You will note that all runners have impressive biographies whether they are listed or not and all runners deserve to be here. Included are a fair number of State champions. The only way to qualify was show you were one of the ten best runners in the region on this day. Here are the seventy-five percent of the fields, which will compete for our national title in two weeks. Good luck to all the harriers. The cross country course at the University of Wisconsin Parkside in Kenosha is a fine yet challenging venue with rolling hills but the undulating terrain can hold water and make things even more interesting. Such was the case on Sunday with very sloppy conditions to greet the runners. Two time defending Wisconsin champion Drew Bosley ran a conservative race and led the bulk of the race but Indiana champion Cole Hocker passed him with about 400 meters to go and kicked it home to earn the Midwest Championship in a time of 16:03. Bosley, who showed no strain as he crossed the line, placed second in 16:09. The point this day was to qualify after all & Bosley easily accomplished that goal by sharing that time with third place finisher Evan Bishop of Michigan. This will be Hocker's first trip to Nationals after placing 15th last year, while Bosley is making a return trip (tenth in 2017). Carter Solomon of Michigan led the second group of finishers with his 4th place effort of 16:13 nipping Colorado's Ares Reading by a second. Ethan Kern of Illinois took sixth in 16:16 with Illinois Champion Josh Methner, a junior, following a second later. David Vannucchi of Wisconsin secured a tip to San Diego with his 8th place finish in 16:18 and Brendan Favazza of Michigan was 9th in 16:19. Michigan's Zachary Stewart scored the final ticket to California with his tenth place finish in 16:22, while Yami Albrecht 's eleventh place time of 16:27 made him the first alternate. Aden Smith, also from Michigan came in twelfth with 16:29 but Nick Foster deserves mention after his 13th place time of 16:32. The Michigan runner had placed 12th last year and was a hard luck placer for the second straight time. Fans often discuss the impact on racing conditions that can vary through the years and this year's Midwest girl's race showed that the muddy conditions this year cost the harriers fifty seconds to a more than a minute and it was easily verifiable due to the number of repeat runners from last year. In 2017 Emily Covert of Minnesota & Katelyn Hart of Illinois battled each other behind 2017 champion Olivia Theis of Lansing , Michigan but the mud this year slowed the leaders down by about a minute. Conditions were such that it was not only difficult to negotiate the course & to pass but mud was being kicked in the runner's face as Covert can attest. By the time they had reached the milemark the race had boiled down to a battle between just five girls with Covert & Ohioan Taylor Ewert being the titular leaders. Hart ran with Abby Vanderkooi, a freshman from Michigan, & Ericka Vanderlende, who is also from Michigan, just behind. Slowly Covert & Ewert opened a gap but Covert asserted herself at the midpoint & slowly pulled away. Emily won by ten seconds with a time of 17:58, while Hart claimed third in 18:14 to finish a second ahead of Vanderkooi. It will be interesting to see how Hart does at Balboa Park, where she placed ninth last year. Ericka Vanderlende crossed the line alone in fifth with a time of 18:20. Adelyn Ackley, yet another Michigan runner, improved on her eighth place finish of 2017 by two places with a time of 18:36and Grace Ping, who came in sixth at NXN as an 8th grader in 2016, claimed 7th in a time of 18:39. Jaden Theis, whose sister won this race in 2017 earned a trip to San Diego with her 8th place finish and Riley Stewart, a freshman from Colorado, took ninth in 18:49, while Alex Morris of Illinois secured the last qualifier by sharing the same time. Brianne Brewster came in 11th with 18:54 & will be the first alternate and Emma Bucher of Ohio was 12th two seconds behind. Sadly not qualifying again wasTierney Wolfgram of Minnesota, who place ninth in the race last year but was only 3th as a sophomore (19:02). Dana Feyen of Wisconsin had the dubious distinction of placing 17th for the second straight year with this year's clocking of 19:09. There were large puddles even near the start of the South Regional, so everyone had no delusions about the running conditions at Charlotte's McAlpine Park. Texan London Culbreath essentially ran on the lead all the way before pulling away for a three second victory in a time of 17:12. Brynn Brown ran beside the leader the bulk of the race before falling behind only to be overtaken near the end by fellow Texan Heidi Nielson late in the race with Nelson gaining a two second edge in annexing second with a time of 17:15. It was the sophomore's second qualifier of her young career. Florida's Valerie Lastria shared the time of 17:17 while placing fourth & Allison Wilson clocked 17:20 to claim fifth. Adoette Vaughan made it five Texans in the top six, as she improved on last year's 9th place finish with her time of 17:21. Alyssa Hendrix of Florida improved by one place this year with her 7th place time of 17:24 and Jenna Hutchins of Tennessee earned 8t in 17:25. A second later Ava Peoples of Texas claimed 9th and Victoria Patterson of South Carolina secured the final qualifier with 17:27.SophomoreMakena Gates ran 17:36 to become the first alternate & had been 13th in this race in 2017. 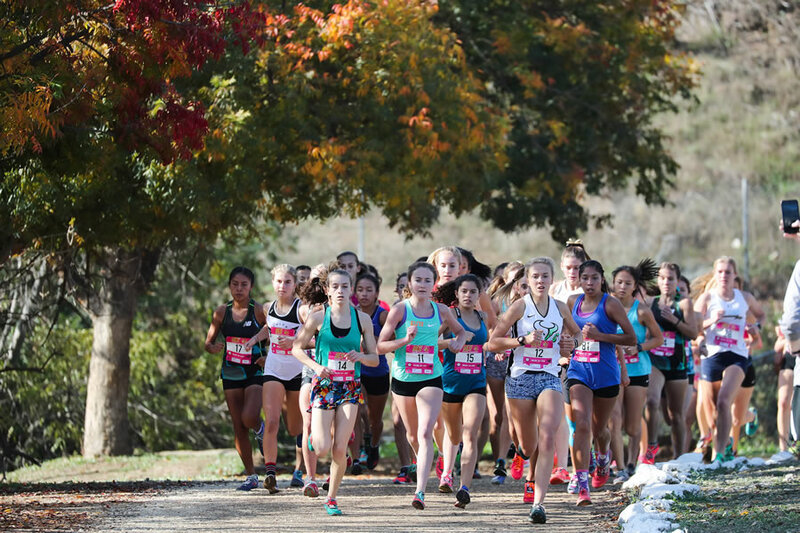 Texans Ashlyn Hillyard (17:39) & Colleen Stegmann (17:45) followed in 12th & 13th, while Ava Dobson of S.C. placed 147h after finishing 16th last fall. With conditions as they were no one really pressed the pace and a group of five or six guys led the field through the various split marks. Texas champion Cruz ran conservatively tucked just behind the leaders in third place before pulling away to claim victory in a time of 15:04.8. Second place went to Carter Cheeseman, also from Texas, in a time of 15:04.94, and in so doing earned his second trip to nationals. Daniel O' Brien of Virginia secured third with a time of 15:07, while fourth went to Colin Baker of SouthCarolina in a time of 15:08. Camren Fischer of Arkansas finished fifth with a mark of 15:09 & Cole Bullock placed sixth with 15:10, as he edged felloe Tennessean Jake Renfree, who shared the clocking. This was Renfree's second qualifier. Van Cortlandt Park in the Bronx is a storied course and the list of who has competed here is a veritable Who's Who of XC running. For many it stands out as he Mecca of the sport and fittingly Foot Locker makes it the yearly home of their Northeast Regional Championship. This, i would note , is a true high school regional meet and no junior high runners are allowed. It is also a true championship with runners coming from many states with no state being given a pass & a separate championship, so as to snare gullible runners to compete in a fraud of a championship. Of course this is the fortieth running of this race, so it offers its own storied past of great runners, who have accepted the challenge of the back hills. Conditions were far better here than at the other venues Sam Lawler of NY pressed the pace and led the field through the initial stages of the race. He ran by himself with the rest of the field content to run as a large pack. Lawler led for some time but by the time they had reached the track Jack Stanley of NJ was in control and he remained so as he entered the chute in 15:30 to claim the victory. Lucas Aramburu of Massachusetts placed second seven seconds later, as he nipped Connor Nisbet of Delaware, who shared the same time. This qualification is historic for, although records for the first year 1979 are incomplete, Connor appears to be the first runner to ever qualify from the state of Delaware. His placement is also interesting, because Connor was the alternate last year after placing eleventh. Aramburu for the record will make his second trip to San Diego. Garden State runners secured the next two berths on the plane Liam Murphy & Devin Hart both clocked 15:38, as they finished 4th & 5th respectively. It is Hart's second qualifier as well. Patrick Anderson of Pittsburgh claimed sixth with his time of 15:38, which he shared with Sam Lawler, who finished gamely after leading the way early. Matthew Farrell was the first of a pair of Connecticut runners with his clocking of 15:38 & Mustafe Dahir followed a second later. Tenth place went to Richard Sturtevant of Ma. who was timed in 15:41 and Benjamin Burgess was the unfortunate one left behind as alternate after his time of 15:43. Sophomore Sydney Masciarelli of Ma. surprised defending champion Marlee Starliper of Pennsylvania to claim a five second victory in a time of 17:12. Both girls were part of a pack of six runners, who led the way early before the eventual leaders asserted themselves. Grace Connolly of Ma. finished third in 17:27 and Abbys Loveys of NJ improved on last year'sninth place finish with her 4th place clocking of 17:49. Connolly, who qualified in 2016, earned her second trip to California. Kate Wiser of Ct. was far happier with her placement this year, as last year's first alternate improved to a fifth place finish in a time of 17:52 and Mary Hennelly of NY earned 6th with 18:07.